On Saturday, we hit both of our picks. We took the Texans and changed our pick from Vikings (+9.5) to Pakcers (-9.5) at around 6:30 once the word was released the Christian Ponder was out and Joe Webb was in. THE PASS RUSH pick ’em league is in a dog fight with four teams tied in first place with 9 games left to pick. The Colts are coming into this matchup in Baltimore with the momentum. The Colts are 5-1 SU and ATS in their last 6 and 8-2 SU and ATS in their last 10. The Ravens are 1-4 SU and ATS in their last five games. That’s the reason that 63% of the public is taking the Colts (+7). I was going to go into the cliche that the Ravens are such a strong team at home, but they’re a surprising 3-5 ATS at home (6-2 SU). The Colts are 4-4 SU and ATS on the road this season. The Ravens have had to top huge lines at home though, the 6-2 home record tells the real story. The Colts have been a great story this year, but their Luck should run out today. 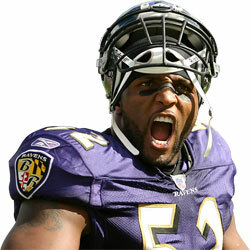 First, we have the return of Ray Lewis who is playing the last home game of his career. The Ravens defense will be playing with extra motivation and determination for Ray. Just like the Colts got a boost last week with the return of Chuck Pagano, the Ravens should be the beneficiary of the emotional boost from Ray Lewis’s last home game. Like I discussed with the Texans yesterday, they played poorly in December and showed up yesterday to take care of business. I believe the Ravens did the same thing. Their team and particularly their defense was decimated by injuries, so I think you had players playing at 75% effort in December in order to nurse injuries. They already had a playoff spot locked up with those last five games left to play. Now it’s the playoffs. I think you see the Ravens defense play like the Ravens defense that we’re used to. On offense, Flacco and Ray Rice will do their thing. I’m taking the Ravens (-6.5). This is a tough game to call. Both teams are coming in with a ton of momentum on their side and both are looking like dangerous wild card teams capable of upsetting the Atlanta Falcons, who the winner of this game will be facing next week. The Redskins are 7-0 SU and ATS. The Seahawks are 7-1 SU and 6-2 ATS. I’m leaning Redskins since this game will be in Washington. If this was being played in Seattle, I would be all over the Seahawks. The Seahawks are just 4-4 SU and 3-5 ATS on the road, while the Seahawks are undefeated at home. Other than the Seahawks big win over the Bills on the road, the Seahawks haven’t been dominant on the road. They lost to the Dolphins, Lions, Rams and 49ers. However, I see a lot of merit in playing the Seahawks today. Their defense is solid, a top five defense in the league. They rank 1st in points allowed with just 15.3 PPG allowed, rank 4th in total yards allowed, 6th in passing yards allowed, and 10th in rushing yards allowed. That defense will be up against an offense that ranks 1st in rushing yards and 4th in points scored. With this one, my head is saying take the Seahawks and my gut is saying take the Skins solely based on home field advantage. This one is a toss up and personal bias has be wanting to see RGIII advance next week.